Himalayan Golden Eagles can travel nearly 125 miles per hour, which is majestic to view from below -- but what about seeing the great birds speed dive from their perspective? With the help of a four-year-old downy bird, Debbie Pappyn, a Belgian travel writer, was able to capture this speedy bird's eye view of the Mongolian plains. 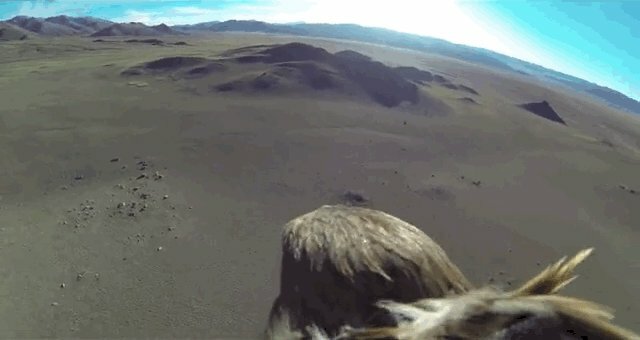 The eagle, who has been trained to help his owner hunt, wore a special harness on her back that allowed her to carry the camera without pain or hindrance while she flew. According to Pappyn's blog, the bird was intensely focused on staying close to her trainer, Oral. "You see on our movie how the eagle is looking over the landscape and how she is going in a straight line for Oral," Pappyn writes. "It is astonishing to see the speed of flight and great to witness the connection between the golden eagle and the hunter."